Our website is currently undergoing scheduled maintenance. Photo Management, Projects and ordering are currently unavailable. We apologize for the inconvenience. 50% Off Your Entire Order! Discount does not apply to shipping. 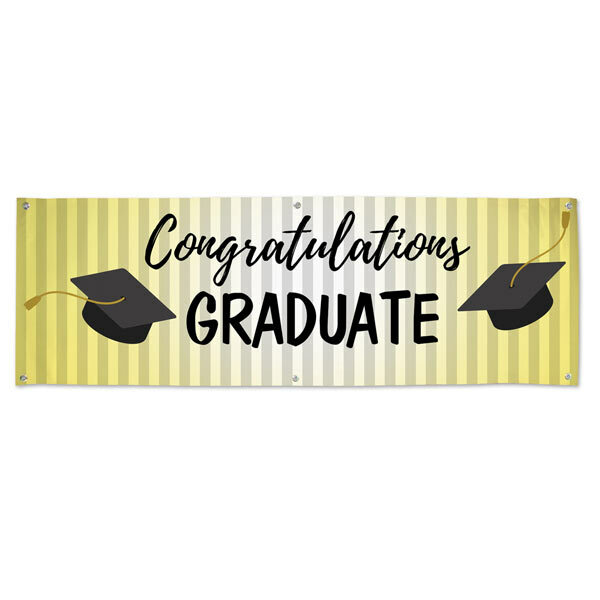 Graduation banner with the text ‘Congratulations Graduate’ printed on the banner with black caps on a gold background. Ideal for graduation parties and events. Stock banners are Glossy, Scrim Laminated, Heavy weight vinyl double needle stitch enforced construction ideal for outdoor use. Customer service hours: Mon-Fri 9am-5pm EST. Excluding all major holidays.